The Helix mattress is a uniquely built model in comparison to most of the other mattresses currently offered on the market today. Rather than giving you a single mattress that is built to offer comfort for most body types, the Helix mattress is composed of layers that are customized to provide you with the comfort you need for your specific body type and sleep needs. Now that we’ve gone over what characteristics you should be looking for in your bed frame, let’s take a look at some of the best bed frames for the Helix mattress! If stability and style are on the must list for your bed frame, you should definitely take a look at the Zinus Upholstered Square Stitched Platform Bed with wooden slats. This bed frame, featuring a wooden body that is covered by dark grey square stitched fabric and supported with a steel frame, is built with durability and stability in mind. The wooden slat system is designed to keep your mattress stable and also comes with padded tape on the slats to prevent the frame from becoming noisy with use. In addition, the frame is easy to assemble and all pieces are contained within the headboard of the frame. 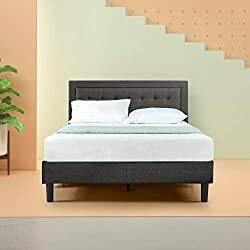 Aside from some complaints that people had with the assembly, this frame has been well-received and is an excellent choice for anyone who is looking to get the most out of their Helix mattress. Whereas the previous bed frame focused on style and stability, this bed frame focuses on ease-of-assembly and simplicity. Let’s take a look at it. The Zinus 14-inch SmartBase Platform Bed Frame is a simple design that resembles two folding tables. All you have to do in order to put it together is unfold the two pieces that come with the frame and attach them in the center. It takes only minutes to put it together. Speaking to the quality of the body, this bed frame is made of metal and is known to support quite a bit of weight. It’s height also gives you extra room to store any loose belongings. The only issue stated here is that some of the pieces have been known to break, which is a big issue. However, this only seems to happen to a handful of users. If you want a minimalistic, affordable design, the Zinus 14-inch SmartBase Platform Bed Frame is the way to go. Forget about other bed frames. If you’re looking for the best of the best, look no farther than the Reverie 9T Adjustable Foundation. The Reverie 9T Adjustable Foundation is a fully-motorized bed frame that is capable of lifting both ends of the bed to support whichever position you most enjoy. The frame comes with a sleek metal and wood design that fully supports up to 850 pounds and features a massage function, an LED remote with a Bluetooth option, an under the bed nightlight, grips that hold your mattress in place, and a wireless charging pad. Overall, there is very little that this frame can’t do. 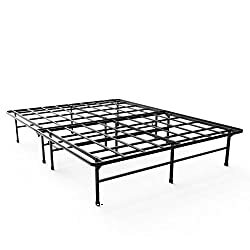 Along with its incredible functionality, there are very few poor reviews of this bed frame and most customers have found that it works exactly as advertised. Need luxury? Go for the Reverie 9T Adjustable Foundation. There you have it! 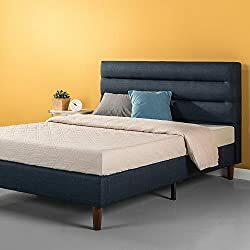 Here is a comprehensive buyer’s guide and a few suggestions of some of the best bed frames for the Helix mattress so that you can get started on your bed frame hunt. As long as you keep in mind what you are looking for in a bed frame, you will be good to go! Before we give you a rundown of some of the best frames for the Helix mattress, here are some characteristics that you will need to take into consideration when you are looking for a bed frame that suits your needs. Both of these materials have their advantages and disadvantages when it comes to using them on your bed frame. For example, metal is very sturdy but it may squeak during use or be easy to move around. Wood is a little weaker but you will most likely not have any problem with sound or movement. In addition, wood may be a more attractive option for your room. Keep these things in mind when you are looking for a bed frame that is built with a certain material. Although some bed frames may advertise themselves as suitable for a certain bed size, the truth is that not all mattresses will be compatible with your bed frame. There will be instances where your mattress may be larger or smaller than your bed frame. This results in a mattress that slips off of the bed frame or moves around during use. To avoid this, simply take a look at your bed frame dimensions and compare that to your mattress’s dimensions to make sure that they match up. Another consideration is the height of your bed frame. A frame that is too high will be difficult to get into and this applies to a frame that is too small as well. Besides the comfort aspect, height plays a role in whether or not you will require extra storage space as well. Think about these things when you look at a bed frame of a certain size and height. We all know that one piece of furniture that required far too much time and frustration to assemble. Unless you are someone who truly enjoys putting together furniture, you are most likely going to want to look for a bed frame that is easy to put together when you first take it out of the box. That being said, you will also want to make sure that it is easy to move around and take apart in the event that you will have to take the frame to another room or a house if you decide to move in the future. These days, there are bed frames that are simply made to support mattresses and there are frames that are capable of lighting up your floor and giving you massages. When you start taking a look at bed frames, it is important that you think about what you want your bed frame to do. If you only need support, almost any bed frame will do. If you want extra storage space or if you want to be able to sit up and read in bed, those are some features that are going to limit the amount of bed frame choices you will have at your disposal. Make this non-negotiable list before you start going bed frame shopping to make things much easier. While this is not the most important aspect of a bed frame, it is one that you will want to pay attention to if you are big on interior design. There are a lot of different styles when it comes to bed frames and each will work with different spaces. Pay attention to the style of your bed frame and pay attention to the look of the room you will be placing it in. This way, you will avoid bringing home the wrong bed frame.